A public sculpture twice as high as the Angel of the North and intended to be visible from road, rail and air, is to be built in the south of England. Five artists have been shortlisted for the £2m public art commission sited on a hilltop in north Kent, including Turner Prize winner Mark Wallinger. The work will mark the new Ebbsfleet International station and the planned transformation of Ebbsfleet Valley. It is expected to be completed on a site next to the A2 by 2010. "It is an iconic thing we're trying to create here," said Allan Willett, chairman of the selection committee, and Lord Lieutenant of Kent. He said the new sculpture, the height of Nelson's Column, would represent the regeneration of north west Kent, and the growth of London eastwards. 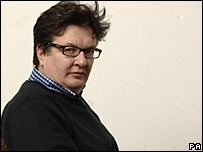 Wallinger won the 2007 Turner Prize for State Britain, in which he recreated in a gallery Brian Haw's anti-Iraq war protest mounted outside Parliament. The other shortlisted names to design the sculpture are French artist Daniel Buren, Turner Prize winners Richard Deacon and Rachel Whiteread, whose work has included a concrete cast of the inside of an entire Victorian terraced house, and sculptor Christopher Le Brun. They will develop proposals for the 50 metre (164ft) Ebbsfleet Landmark over the next three months, with the final work to be chosen by a selection panel. "Its current position at the nexus of road and rail links to Europe emphasises its position as a gateway to London and England - a position it has enjoyed since the Romans built Watling Street. "The challenge is to create something enduring that is a landmark for the transient passenger or motorist and a cherished part of the town. "Chalk quarries, cement works and the remains of the paper industry now dot the landscape. "There is a wealth of material and historical inspiration for an artist." Whiteread said: "It has been a long time since I have been so excited about a project. "Having grown up close to the area, I find the landscape of this part of Kent familiar, fascinating and inspiring. "Properly-funded commissions of this scale and ambition are rare." 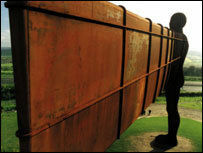 Antony Gormley's steel Angel of the North was unveiled on a hill overlooking the A1 at Gateshead in 1998 and has been named a British icon.